• 20 grams of Pure Whey Protein with No Added Aminos or Fillers!• No Artificial Ingredients! • Naturally Sweetened with Monk Fruit and Stevia! • Zero Sugar, Fat and Cholesterol! 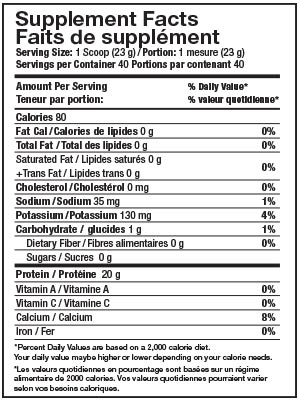 • Only 1 gram of Carbohydrates! Introducing the new and all natural ISO WHEY BREEZER, a delicious and gourmet style protein shake made with 100% Real Whey Protein Isolate with no artificial sweeteners, colours or flavours! ISO WHEY BREEZER have zero amino fillers, meaning all 20 grams of protein per scoop is 100% Real Whey Protein Isolate and not a combination of protein & amino acids like other protein isolate products. ISO WHEY BREEZER are manufactured under the strictest GMP quality and safety guidelines and made through the superior Cross Flow Microfiltration (CFM) extraction process, filtering out fat & lactose for an undenatured and bioactive premium protein isolate. ISO WHEY BREEZER are the perfect choice for anyone looking to add healthy protein to their diet and especially for those looking to tone up or trim down! 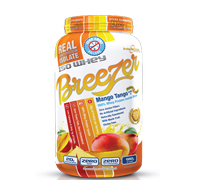 ISO WHEY BREEZER are the most delicious and nutritious way to enjoy an all natural protein supplement! Who knew all natural could Taste So Good! A New 100% All Natural and Pure Whey Protein Isolate formula with a Refreshing Breezer Juice Blend Protein with a delicious gourmet flavour! Ingredients: Dairy Protein Blend (Whey Protein Isolate, Whey Protein Isolate 97%) [21.96 g]; neutral protease [10 mg].